This morning saw the launch of iOS 8.4, and with it Apple Music. And even if you’re not a Taylor Swift fan, there’s still some joy to be had in the world: the Beats 1 radio station, DJed by Zane Lowe and free for everyone with an Apple ID, started its broadcast at 12PM Eastern. The news came from Apple Music senior director (and former Beats CEO) Ian Rogers. The iOS became available at 11AM EST—you’ll need to download it in order to get access to Apple Music. The radio will start an hour later, to give you time to complete the update and mentally prepare yourself for some never-ending Zane Lowe. 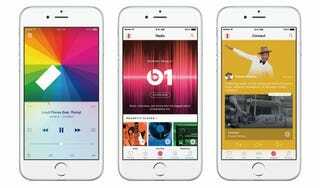 Apple VP Eddy Cue also quietly announced that with the launch of iOS 9, Apple will increase the song limit on iTunes Match, up to 100,000 songs from 25,000.